Given that the city's entire western edge is a gorgeous strip of Mediterranean coastline, it's unsurprising that beach visits are among Tel Aviv's most popular tourist activities. The city is blessed with almost year-round sunny weather and warm sea temperatures. Most of its beaches are free and boast decent facilities such as toilets, showers, deck chairs and umbrellas. 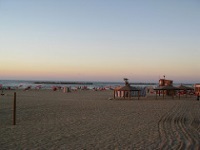 The coastline is divided into about ten beaches, all of which have their own appeal. Hilton Beach is best for swimming, while Gordon Beach is popular with tourists and has some good bars and cafes. Backpackers and bohemian types tend to enjoy Drum Beach (where there are frequent evening drumming sessions), and gay travellers will feel especially at home at Atzmaut Beach. For surfers, Hilton Beach South has some terrific waves. Dog walkers should head to Hilton Beach North. Givat Aliya Beach's calm waters, shallow ocean pool and children's playground make it a great stop for kids. Those who prefer a quieter, less crowded beaches should try Trumpeldor, though it doesn't have lifeguards or much in the way of facilities.